If you are looking at political risk in America ten years down the road, what variables would concern you the most? I’d propose a combination of fiscal and poverty uncertainties, and an underlying demographic certainty. This post is about the two uncertainties; I’ll talk about demographics in the next one. The most recent fiscal years recorded the two highest budget deficits in the US since World War II. The Congressional Budget Office (CBO) estimates that on current trends the federal debt will rise from 62% to 87% of GDP by 2020, and all government debt (federal + state + local) will be 110% . This, according to IMF, is among the worst fiscal trends in the advanced industrial countries. The uncertainty is about what will end up being done to reduce debt. Though America has been able to borrow easily from abroad, that faucet is getting tighter. President Obama’s Simpson-Bowles commission is coming up with proposals, targeting entitlements (social security, Medicare, etc. ), which make up 60% of government spending. Retirement age will be increased, Medicare benefits will decrease, along with a host of other initiatives. The proposal to reduce government debt prioritizes spending cuts over tax increase. Congress just decided to extend Bush-era tax cuts, which adds to the fiscal uncertainty no matter how one looks at it. 70 percent of the debt reduction is to be achieved through spending cuts. But my forecast is that cuts in spending will largely bypasses defense and security, the largest component of discretionary spending . Although the Simpson-Bowles plan calls defense cuts, including closing one-third of overseas bases, Republicans want to prioritize non-defense discretionary spending, which, according to The Economist, “would entail savage cuts to federal services without cutting the deficit much” . Now here’s the wider context in which the “savage cuts” are planned. According to the 2010 census results, median American households have become poorer over the last decade. Between 1999 and 2009, national real median household income has fallen from $54,058 to $50,221. It has decreased in every state except five in which income is derived largely from natural resources, such as Alaska and Wyoming. In places like Michigan, median income has fallen by a drastic 21 percent . As of November 2010, unemployment rate was 9.8%, quite high . Many argue that the effects of the stimulus package are wearing off, which was behind the Fed’s decision two weeks ago to inject another $600 billion into the system. But the proportion of the employed population that has taken limits on pay, such as furloughs, pay cuts, etc., is the highest it has ever been. The latest addition is President Obama’s 2-year pay freeze for federal government workers. This freeze, by the way, excludes defense. In the next ten years, will real household income recover significantly from this trough? That part is uncertain. In New York City, income has bounced back. In Q1, 2010, average weekly wages there have increased almost twelve times the national rate . The main reason is that the government’s bail out nicely got Wall Street out of the mess it had created in the first place. But Main Street languishes. If we put these two axes together, as shown below, we have a crude 4-scenario matrix. Obviously, this is ideal-type—but it helps us visualize political risks. The X-axis is about the fiscal uncertainty, specifically, the proportion of non-defense-related budget cuts in overall government austerity measures. The higher the proportion (shown on the right hand side), the greater the negative impact on welfare programs. The left quadrants depict the opposite: greater share of defense and security-related spending in overall budget cuts. The balance is uncertain because it will depend on Republican vs Democratic tussles in the coming years. Nonetheless, both welfare and security-related cuts will directly affect a large portion of the population. As economists Sam Bowles and Arjun Jayadev estimate, in post-9/11 America, 1 in 4 Americans in the labor force are direct or indirect parts of the security industry . The Y-axis is about poverty, specifically the extent to which median households are able to recover from their downward trend in income. The bottom quadrants depict continuity of stagnation or an actual decrease in real income. The top quadrants depict a rosier picture, where the economic stimuli have worked, private sector begins to grow and employ more people, the government as a consequence gets greater income, and in general, all is well economically. 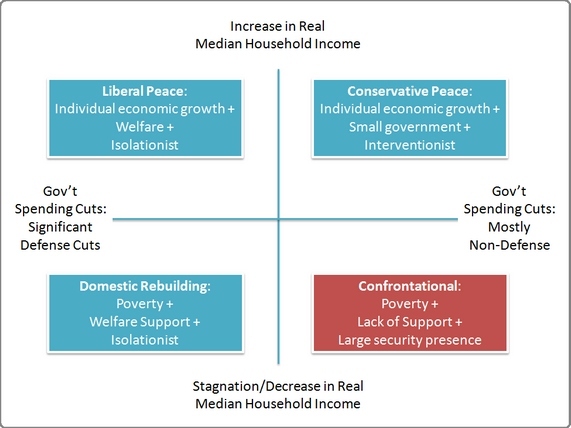 The bottom right quadrant is “Confrontation.” Median income has stagnated, but social services have been scaled back significantly. A greater proportion of people are floating, and desperate. In addition, large spending on defense and security continues, and America is continually embroiled in foreign interventions. The domestic security industry is also booming. In my mind, this is the politically riskiest combination. So, which one, roughly speaking, are we heading toward? What other big variables might come into play? And what happens if the any of the other quadrants materializes? Note:  Discretionary spending is spending that is not statutory, i.e., it needs to be proposed and approved every year. The other references are linked directly to the sources online. After the Jabulani experiment (see my previous post), FIFA has further demonstrated examples of how to mismanage political and public relations risks. FIFA’s recent PR battering came from a set of refereeing mistakes made in some crucial games of World Cup 2010. In the first round, USA was disallowed a legitimate game-winning goal in a match with Slovenia. Brazil’s Fabiano handled the ball illegally in scoring against Ivory Coast. In the second round knockout games, a clearly legitimate strike by England’s Frank Lampard was disallowed. This goal, by which England would have tied Germany 2-2, would have completely changed the game. In the next match, the referee allowed an illegal offside goal by Argentina’s Carlos Tevez against Mexico. England and Mexico ended up losing badly. Referee mistakes happen; it’s human. Unfairness happens; it’s life. But most high-profile sports use technology to minimize errors and ensure the games are as fair as possible. FIFA’s stance, however, has been adamantly against using technology to assist referee decisions. This is inexplicable and outdated. FIFA’s reaction to the recent events had five aspects. Let’s look at these, for these are things you should not do if you’re serious about managing political and public relations risks. 1. Ostrich syndrome. Right after the horrendous England and Mexico incidents, FIFA buried its head in the sand and said, “FIFA will not make any comments on decisions of the referee on the field of play.” So, first impression of the public: FIFA just doesn’t care (as long as the money keeps rolling in). 2. Blindfold and gag rule. FIFA’s spokesman Nicolas Maingot later came out to admit that a mistake had been made. From FIFA’s perspective, the mistake was to show on the stadium’s screen the video replay of Tevez’s illegal goal. FIFA said it will be careful to further censor instant replay of match moments. Wow! Impression of the public: FIFA is an autocracy; you should only see, hear, and feel what FIFA wants you to see, hear, and feel. 3. Revisionism. Then FIFA resorted to revisionist writing to cover up what happened. FIFA’s official website reported the Lampard incident as follows: “Meetings between these two sides [i.e., England and Germany] often provide talking points and this one’s came 60 seconds later when Lampard’s shot from the edge of the box struck the underside of the crossbar and bounced down, with the referee ruling the ball had not crossed the goalline.” Really? It just bounced down, and it was merely a “talking point”? It was so blatant that even Germany’s Angela Merkel apologized to the British Prime Minister right afterwards. Similarly, on Tevez’s offside goal, FIFA’s website reported, “Messi was quick-witted enough to return the ball towards goal, where the Manchester City striker [Tevez] was waiting to head home.” With another sleazy sleight of hand, FIFA made it sound as though was a natural, legitimate goal. Public’s impression: FIFA officially doesn’t give a damn about truth. 4. Sticking to guns. As the storm raged further, FIFA kept referring to its decision in March to not introduce any referee-assist technologies. FIFA’s president Sepp Blatter had said then, “No matter which technology is applied, at the end of the day a decision will have to be taken by a human being. This being the case, why remove the responsibility from the referee to give it to someone else?” At a press conference after the England and Mexico incidents, FIFA’s spokesman said, “we obviously will not open up any debate [on the issue].” Public’s impression: FIFA leadership belongs to the nineteenth century. 5. Swallowing words — but not enough. In the last election, Mr. Blatter struggled to get elected, securing just 66 of 207 votes. With his outmoded stubbornness, he has clearly lost the confidence of more big countries now. He will not win the next election, and that will be good for world football. Still, he made a last-ditch effort to rescue his politics by eventually calling up the football federations of England and Mexico and apologizing for what had happened. And then, he said, “it would be a nonsense not to reopen the file of technology,” but restricted FIFA to considering only goal-line technology. FIFA is still unable to put forward a sound reason why it is unable to conduct an open and public discussion on technology. Public’s impression: FIFA is incapable of learning fully. It’s clear, isn’t it? FIFA should have come clean after the two games, admitted the referee mistakes instead of trying to cover them up and blaming the public for watching the mistake on a giant screen, and become open to more ideas for incorporating technology. From a risk management perspective, it should have begun long ago. When every other major international sport embraced technology to assist human decision, Sepp Blatter continued to insist that the “human aspect” of the game must be preserved. One got the sense that in Blatter’s mind, robots are taking over the field. Tennis uses hawk-eye and a system of player challenges. Olympic races use photo finish technology. NFL uses a television review system. Basketball also uses review to some extent. Cricket uses hawk-eye and a third official referral system. So why not the world’s most popular sport? FIFA said it will disrupt the flow of the game. But the game already stops at every whistle the referee blows. FIFA claimed that the human mistakes are part of the game, and ultimately, even with the inclusion of technology, humans will have to make the decision. That’s flatly silly. The goal is not to replace humans with AI, but use technology to assist humans. The referees already wear headsets and communicate with each other. That’s technology. Why can’t they refer a controversial decision someone who has a clearer view using TV replay? Some say that it will increase the cost of administering games. That’s also silly. Football is the world’s largest sport; it makes more money than any other sport by far. If a smaller sport like cricket can afford it, football surely can. The one crucial lesson FIFA should take from its poor record at risk management it to be more open to ideas going forward. Instead, it is showing a characteristic obstinacy by restricting the discussion to goal-line technology only. It should evaluate arguments about a referral system. If a referee deems an event controversial or unclear, there is no reason why he should not be able to refer it to another official for instant review. The play will stop anyway, and it works well in other sports. And, from FIFA’s perspective, it should give the organization a little window to make more money by selling ad rights. The Adidas Jabulani Ball: A Risk Disaster? The start to the world’s biggest sporting event, the FIFA World Cup 2010, is a lesson in poor risk management. No, it’s not the political risks of South Africa: The country has managed the event spectacularly. The flop is an over-engineered ball, the Jabulani. In every match that I have watched, the vast majority of free-kicks have sailed over the goal. Most corner kicks and other set pieces have overshot their targets. Many long passes have bounced over the heads of the recipients. Those shots that make it to the goal are harder to predict and grasp. Many top goalies, including Italy’s Gianluigi Buffon, Spain’s Iker Casillas, Brazil’s Julio Cesar, Australia’s Mark Schwarzer, and England’s David James, have sharply criticized the ball. As I see it, the strategies of FIFA, football’s international governing body, and Adidas, creator of the official ball, might have been overtaken by a marketing obsession that was not grounded in proper risk analysis. Adidas wanted to create a ball that’s fast. FIFA wanted to increase pace in an already fast-paced game, a game without the type of “time-out” interruptions you see in typical American sports. Adidas claims the ball is the roundest and speediest yet. The speed and flight would translate into more goals. More goals = more viewer excitement, especially in the world’s biggest underdeveloped football market, the United States. The hope is that millions of soccer fans, fueled by goals galore in the World Cup, will shell out $150 to buy this sophisticated ball, generating a nice chunk of cash for Adidas and corresponding royalties for FIFA. 1. Altitude. Adidas blames the ball’s strange movement to altitude. It’s surprising that Adidas marketers and designers did not take this adequately into account. Most places in the world, and especially South Africa, require balls that would behave predictably in different playing conditions. People play football on grass and sand and dirt and streets, and in different altitudes, not inside a lab. 2. Lab-idealism. Which brings me to the second point. Adidas claims that the ball reacts the exact same way each time a robot kicks it. But on the field, human players kick it, and the ball behaves to the unpredictable twitches and curls of each individual foot in ways that surprise the players. The ball’s “Grip N’ groove” technology makes its movement closer to “true flight.” Well, Adidas, this is a football, something you kick around, not launch into space from NASA’s Kennedy Center. 3. Strike Rate. Adidas and FIFA knew the ball would be difficult for goalkeepers to handle, especially in the air, resulting in more goals. But did they count the risk of strikers not being able to predict the ball’s movement?No wonder then, that Brazil’s main striker Fabiano called the ball “supernatural,” before adding, “it’s very bad.” The chart above shows the reality: scoring is at a historic low. 5. Goodwill. People are questioning if Adidas is really working for the good of the game. Why fix something that already works very well? Adidas’s strategy and glitzy ads are proving a bit static against the torrent of criticism that the ball is generating. Players have called the ball “a disaster” and even “the worst ball ever.” People are talking about boycotting Adidas products. Adidas has hinted that mainly teams sponsored by rival companies are criticizing the ball. But we fans are watching the World Cup, aren’t we? And the ball’s strange movement is clear. In the days of networked consumers, bad word travels real fast. 6. Revenues. Will all these affect the bottom-line? All else equal, yes. If professional football players are unable to predict how the ball will behave, why would ordinary people buy this expensive object to replace their trusted leather footballs? However, Adidas’s Jabulani sales have been good in the US, but it’d be interesting to watch Adidas’s share price here as the competition progresses. This fiasco, from both a product and public relations standpoint, could have been avoided if Adidas and FIFA had properly conducted risk analysis as part of their lofty marketing plans, and gave such analysis importance. They would have known then that the risks of spoiling the quality of the world’s greatest spectator event by introducing an untested, unpredictable product is unjustifiable, even from the bottom-line perspective. Football is the world’s most popular sport partly because the game is beautifully simple. All you really need is a ball. The whole game revolves around this round thing. But Adidas and FIFA may have taken their eyes off it. Is Adidas willing to risk a quality flop at the World Cup in order to maximize short-term revenues? Well, in a competitive market, one’s mistake is another’s opportunity. So don’t be surprised if Nike or Puma or Reebok comes up with a glitzy ad of their own that makes fun of an over-engineered ball playable only by Wall-E.
Ok, time to take a break from the South Asia forecasts and talk about something a bit more global: The 2010 FIFA World Cup. In anticipation of the world’s greatest sporting event, three major investment banks have put their stakes on the table. Will the quant models of JP Morgan Chase, Goldman Sachs, and UBS trump your gut feeling? Let’s take a look. The JPMC report is based on “a simple Quant methodology” in which analysts looked at four categories of variables that they normally use in studying companies: Valuation, Market Sentiment, Fundamentals, and Price Trends. Each category was broken into specific proxy metrics, and countries were ranked for those indicators. FIFA World Ranking and Bookmakers’ Odds, for example, were the two metrics for Valuation. Price Trends were estimated by looking at historic trends of those two indicators. To come up with a composite score, the analysts weighted (admittedly arbitrarily) each category: Valuation 40%, Sentiment 15%, Fundamentals 15%, and Trend 30%. After this, the strongest teams to emerge were Brazil, Spain, Netherlands, and England. The next step was particularly innovative. To account for penalty shootouts in tied games, the report measured “Ability to Score” (=goals scored/games played) and “Goalkeeper Ability” (=goals conceded/games played). Brazil ranked very poorly in this metric, not even in the top ten. The analysts plugged in the model score of each team to predict the outcome of each game; in case of draws (teams of similar strength), the penalty shootout model predicted the winner. This throws out Brazil, the overall strongest team, in a quarterfinal penalty shootout against Netherlands. The other surprise is that Slovenia, on the back of recent trends, advances to the semifinals. In the final, England beats Spain on penalties based on their much better shootout record. In contrast to JPMC, the GS report does some macro analysis. It notes a weak relationship (-0.17) between GNP/capita and FIFA ranking. But there’s a stronger and positive correlation between improvement in FIFA ranking since 2006 and the overall economic growth environment of a country, especially if the two outliers, Brazil and Argentina, are excluded. In short, if emerging markets want to improve their chances in the World Cup, they better invest in growth and human development and improve rule of law. Equity market performance is not a good indicator of World Cup performance. GS predicts that Brazil is going to be favorites for a long time to come. Not only is its past performance (64-14-14) better than any other country (Germany is second, at 55-19-18), but its growth environment is healthy and its demographics, esp. number of males, are stronger than European countries. It is also a large football market. Now, the main question: Who will win? The narrative in GS’s report reads mostly like a journalistic analysis, purposely devoid of numbers. It looks through the groups, and predicts England, Argentina, Brazil, and Spain as the semi-finalists. The report then introduces a simple probability model. Like JPMC, the main inputs into the probability model are official FIFA rankings and odds from different bookmakers. (I suspect a high multicollinearity between these two variables.) Arbitrary weighting is another problem, and GS admits: “Our model-probabilities are intuitive to a large extent” (p. 65). While JPMC explains its method in detail, GS does not. The model predicts Brazil as the winner, and Spain with the next highest odds. Overall, GS opts for a more conservative outcome than JPMC. GS’s report has a couple of other gems. One, it polls its clients (N=an astonishing 2,955) to come up with a Dream Team. It also lists odds for the golden boot award: Villa, Rooney, and Messi top the list. Unlike GS’s global review, UBS focuses on Africa, with an eye to promoting the continent to investors and philanthropists. The report was published by its Wealth Management Research group. Once the selling is out of the way, UBS considers three criteria in making its prediction. The first is past performance. Unlike the other two banks, UBS uses Elo ratings, a system developed by Hungarian-American Physicist Arpad Elo. This apparently determines the strengh of teams better than FIFA ranking does. The second consideration is whether or not a team is the host nation. UBS gives home ground advantage much more prominence than does JPMC or GS. UBS notes that 63% of the time the hosts have reached semifinals. Now it’s doubtful whether South Africa can add to this trend, but most people didn’t consider South Korea in 2002 either. The third element is — yep you guessed it — a proprietary model, described as “an objective quantitative measure that assesses the strength of each team three months before the start of the World Cup.” Fine. UBS also claims flat out that socio-economic factors and GDP growth have “no explanatory power when it comes to forecasting the performance of a specific team.” That also makes sense. But disappointingly, UBS does not reveal the workings of its model. In the end, Brazil emerges on top, with 22% probabilty to win the World Cup. UBS puts Germany (this was before Ballack’s injury) at 18%. England, JPMC’s favorite, has only 4% chance of winning according to UBS. So does fancied Spain, even though if you look at bookmakers’ odds, Spain is numero uno (4/1), edging out Brazil (9/2). All the more reason to wish UBS exposed details about its model. Is one prediction better than the other? Let’s just take the bankers’ playbook and do a meta-analysis using “an objective quantitative measure.” Let’s assume, with good reason, that the overall predictive power of the quant models of each bank is reflected in its relative stock price trend. After all, if their models perform consistently well, their trading desks will make more money, and investor confidence will drive up the stock price. In short, although multiple factors exist, we simply assume that relative stock price movements subsume all such factors into one neat proxy metric. The chart below shows the relative stock price movements of JPMC, GS, and UBS for the last three years (2007=0). As you can see, all three ticker indices are down since 2007. But JPMC (-20% approx.) has outperformed GS (-40% approx.) and UBS (-80% approx.) pretty consistently for the last 2.5 years. Therefore, JPMC’s prediction is more reliable. Does all this mean you should get out your excel sheet and hash out some kind of model? Chances are, you already know all you need to know from just following football. So my advice: just stay put on your couch. After all, even UBS admits, “one needs to be humble about the predictive power of one’s models,” before concluding that forecasting football is more art than science. That’s good news for me, because none of these analyses made me change my mind. I’m rooting for Spain.